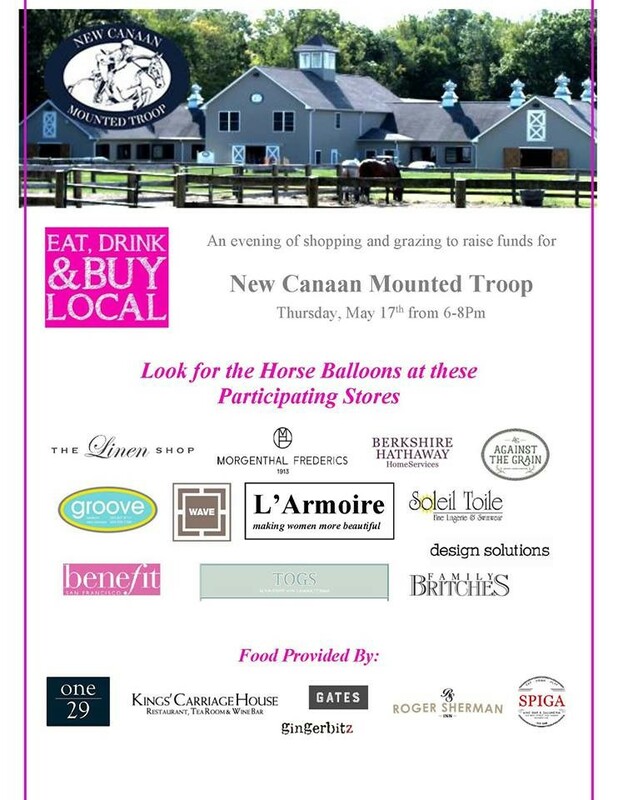 We have organized a shopping and eating event to raise funds for New Canaan Mounted Troop on Thursday, May 17th from 6-8pm. Join the following retailers for delicious bites. Purchase anything over $20 or make a donation and you will be entered into a drawing to win a plethora of prizes, including a $2,000 pearl necklace. Look for the horse balloons! Morganthal Fredericks (Spiga) Linen Shop (Carriage House) TOGS (Gates) Groove (GingerBitz) Soleil Toile (Baldanza Cafe) Against The Grain (ONE29 Restaurant) L’Armoire (Roger Sherman Inn) Family Britches, Design Solutions and Wave.